Harris Craft 50' with 5.2m beam! Solid, stable, fast and economical charter vessel in AMSA survey. 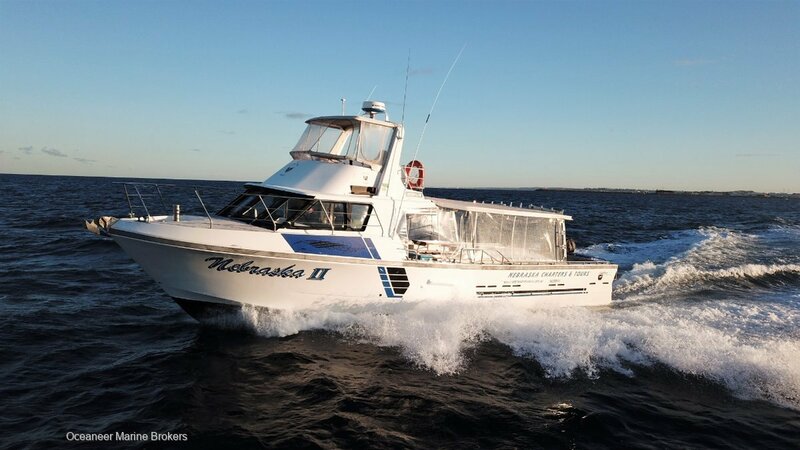 Great numbers for Rottnest Island and Swan River offering 29 Passengers in 1D, 40 in 1E and 12 in 2C. Recently repowered with brand new 820HP V10 Doosan main engine. Very economical 19 knot cruise at just 1900 RPM with a sprint speed of 23knots. Near new Sea Wasp 8KVA generator with only 1400 hours on the clock. Fitted with 2 Kw inverter for back up 240V power. Vessel is well equipped with navigation systems. Furuno FCV1150 echo sounder with a 3Kw transducer at 50Hz and 2Kw transducer at 200Hz, Furuno radar and CPlot plotter program TMQ auto pilot, HF & VHF radios. 2600L fuel capacity, 500L water. This vessel was built to USL 3B standards and was launched in 1993 as a lobster fishing vessel. Original below deck live tanks have been converted to storage and a black tank. Well worth considering for commercial fishing operations. Please contact Oceaneer Marine Brokers on (08) 9243 6373 or via email, sales@oceaneermarine. Com. Au for full inventory and more details.